Ruby Rose Langenheim is a very popular Australian model, an actress, and a video jockey. She began her career as a model by participating in Girlfriend, an Australian magazine model search in 2002. She collaborated with the Australian fashion label, Milk and Honey, to start her own fashion line including washed jeans, leather jackets, and T-shirts. She has been a very popular face on television not because of her style statement, but also for her love towards tattoos. She has inked number of tattoos on her body. Let’s read further to know more about her tattoos and their meanings. 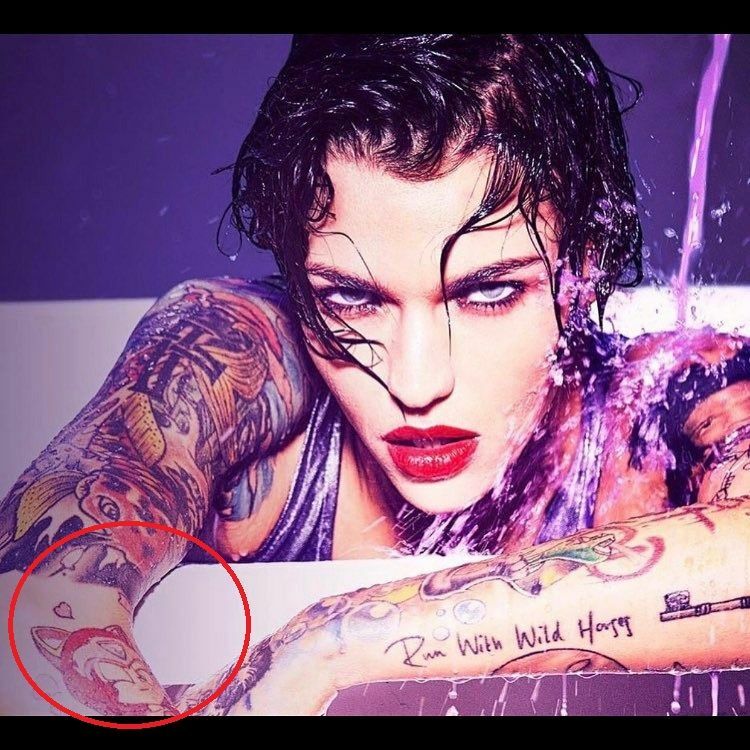 Meaning: Ruby Rose has inked a beautiful ruby stone tattoo on her right forearm as a tribute for her first name Ruby. Ruby is a stone of Divine Creativity. It boosts up the energy levels and intuition power. It attracts positivity, wealth and progress in life. 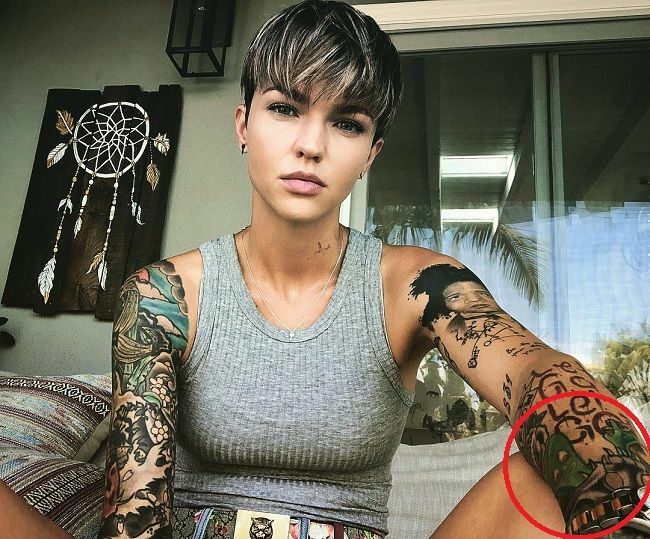 Just like Ruby Rose, this tattoo of her is totally unique like her. Tattoo: TRUST IN GOD Tattoo has been inked by Ruby on her right forearm. 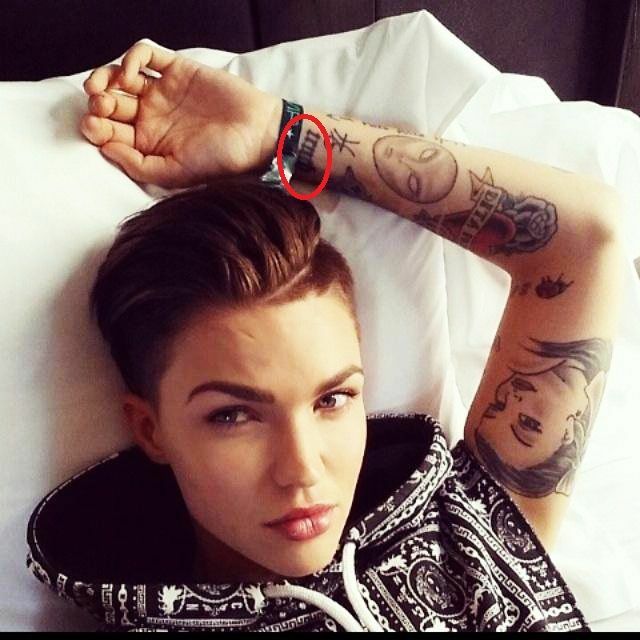 Meaning: Just below her ruby stone tattoo, Ruby Rose has inked TRUST IN GOD in bold letters on her right forearm. It’s a very colorful tattoo with each letter of the text in different colors. It shows that she is a spiritual person who believes in God. Tattoo: CROSS tattoo on the right forearm. Meaning: A simple cross has been inked by Ruby on her right forearm just below her TRUST IN GOD tattoo. It’s a very simple tattoo in black color. It shows that she is a strong believer of God. 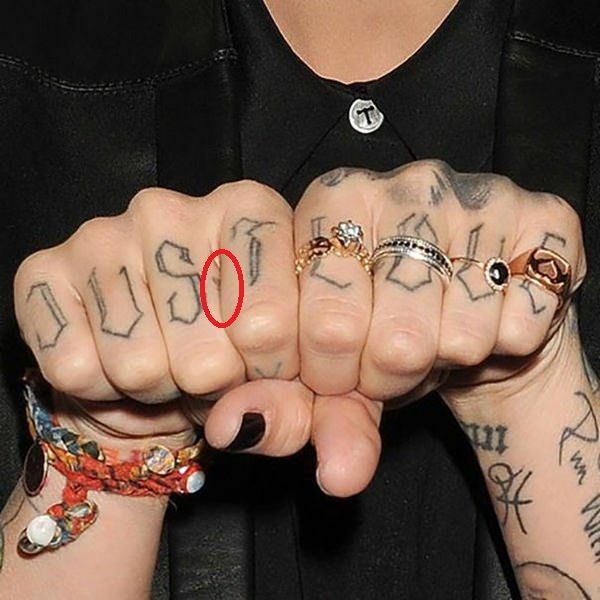 Tattoo: MTV Tattoo on the fingers of her right hand. Tattoo: JUST LOVE Tattoo on knuckles of her both hands. Tattoo: KING Tattoo on the middle finger of her right hand. Meaning: A word KING in the bold letter has been inked by her on the middle finger of her right hand. Ruby Rose came out as a lesbian at the age of 12. She even confessed publicly in media that she always wanted to be a boy and not a girl. In 2008 and 2009, she was chosen as one of the “25 Most Influential Gay and Lesbian Australians” by SameSame, an Australian online gay and lesbian community. Maybe because of her sexuality and her wish to be a boy she has inked king tattoo on her middle finger. Her dog’s name is also king. Meaning: Ruby has inked a blue sparrow at the nape of her neck. Birds are usually called as the symbol of freedom. This tattoo has been historically used by sailors for their sailing experience. They believed that if the sailor drowns, these birds will carry their souls to heaven. Tattoo: Four Stars Tattoo behind her right ear. Meaning: A pattern of four stars has been inked by Rose behind her right ear. Stars are usually symbols of protection, guidance, and good luck. It has also been called the divine relationship of a person with God. 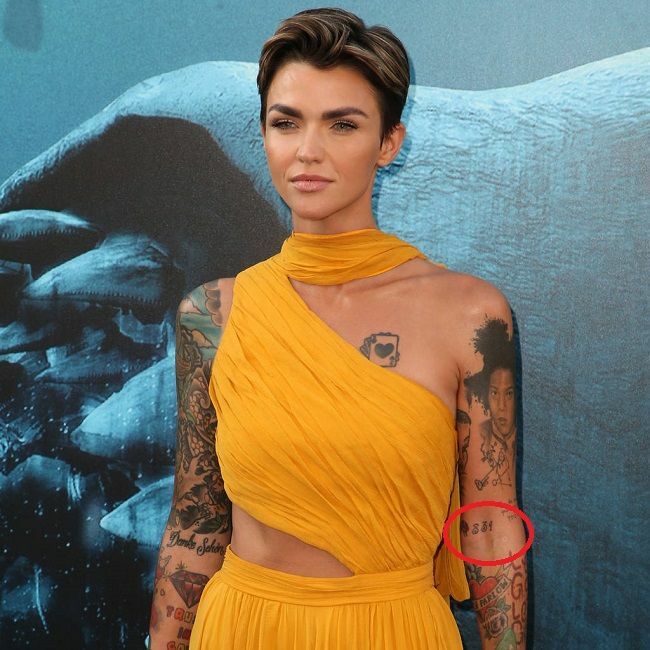 We have already noticed that Ruby Rose is a spiritual person, so she might have inked cluster of four stars as a symbol her divine relationship with God. 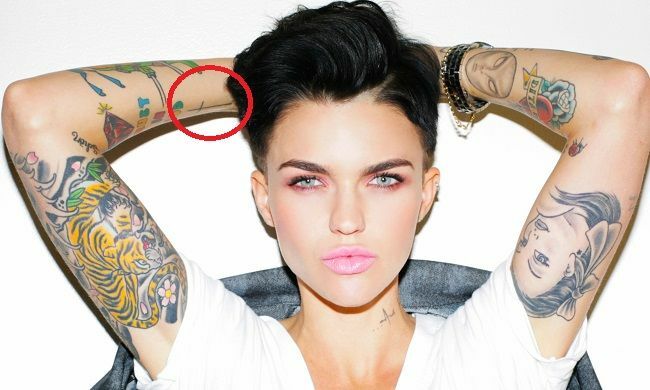 Meaning: Ruby Rose has inked LOVE Tattoo behind her left ear. Love tattoo can be called as the symbol of feelings towards someone. 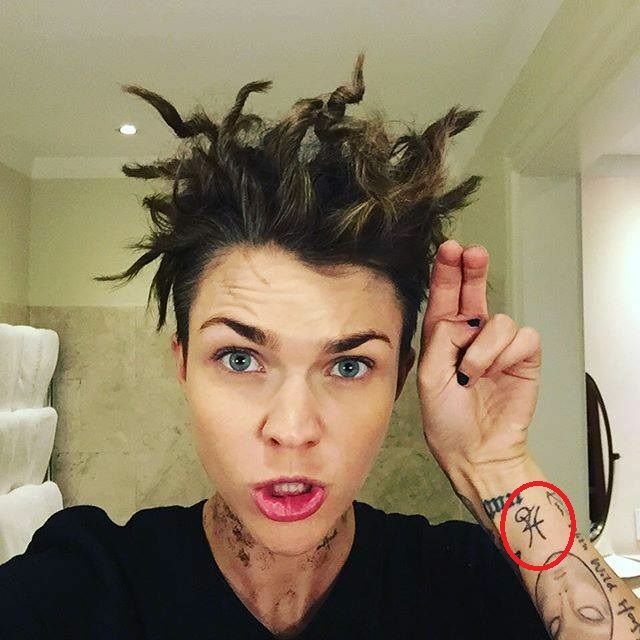 Rose showed her love tattoo in 2009 by posting a picture on her official social media account with a caption, “For her…”. This is probably for her girlfriend in 2009. Tattoo: MUM Tattoo on side of her right wrist. Meaning: Rose was born to a 20 years old single mother, Kate Langeheim, in 1986. Ruby considers her mother as one of her role models. For her love and gratitude towards her single mother, she has inked MUM tattoo in colorful bold letters on side of her right wrist. Meaning: The word truth means genuineness, honesty, and sincerity. Rose has inked the word truth in bold letter on her left wrist. It specifies the basic nature of the person getting it inked. Meaning: A ladybug is a symbol of good luck. It is a symbol that our wish would be granted soon. A tattoo of ladybug has many different meanings, but generally, it means that some good news in coming on your way. 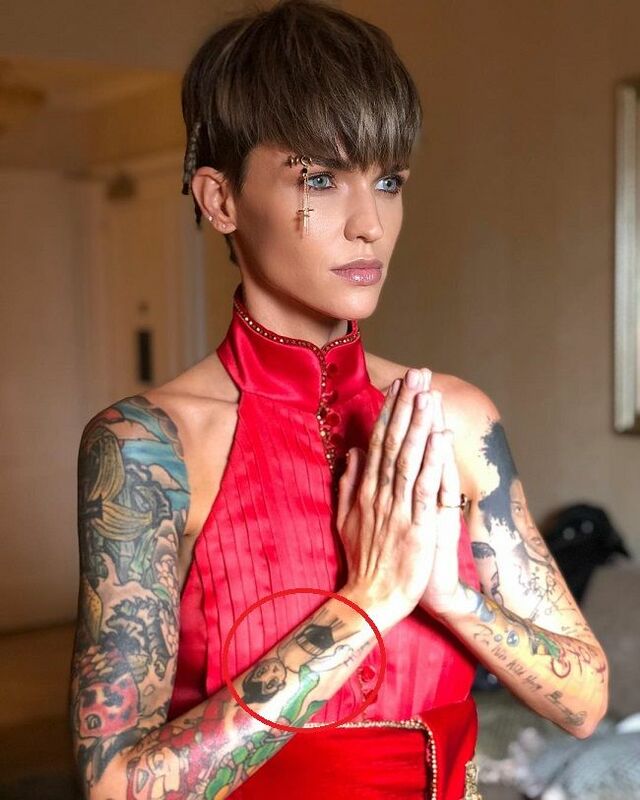 Ruby Rose has inked a ladybug on her left arm near her elbow for her good fortune. 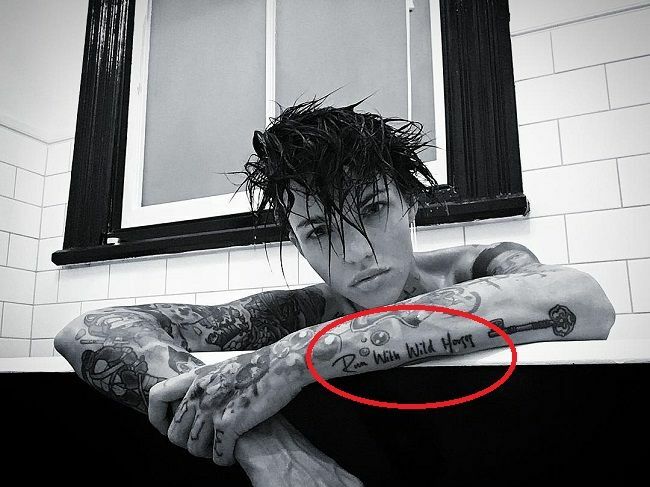 Meaning: Ruby Rose has inked word ‘Danke Schon’ on the inner side of her right arm. It’s a German word which means ‘Thank you very much’. She even shared picture of her this tattoo on her social media account in 2010. Tattoo: Astro Boy Tattoo on the right forearm. Meaning: Astro Boy is a Japanese manga series. It’s a story about a robot with high incredible powers, who is disowned by his creator, goes on a journey of identity and self-acceptance to become the greatest hero of all. Inspired by this storyline, Ruby Rose has inked the character Astro Boy on her right forearm in 2012. Meaning: Gumby is an American clay animation franchise based on green clay humanoid character. Ruby Rose has inked Gumby character wearing a purple cat costume with a spray painting the wall with words ‘Let Go Let Go’ onto a wall. 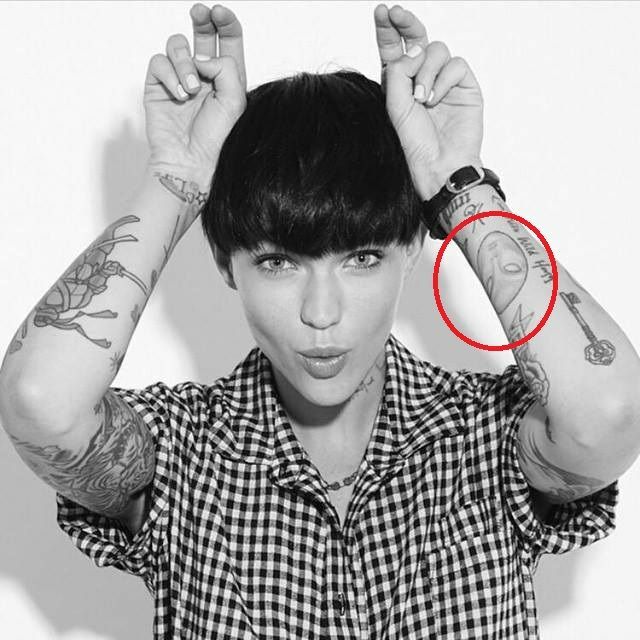 Meaning: Ruby Rose has been very fond of cartoon characters. She has inked Gumby character wearing a purple cat costume with a spray painting the wall with words ‘Let Go Let Go’ onto a wall. Tattoo: Three Heart Playing Cards Tattoo on the left side of the chest. Meaning: Ruby has got three heart playing cards tattoo on the left side of her chest. The first card is the three of hearts followed by two cards of number three. Below this tattoo, she had even inked letters ‘CM’ probably for her former fiance Catherine McNeil. But later on, she got the letters removed by laser procedure. Tattoo: Smile Tattoo on the left side of her rib cage. 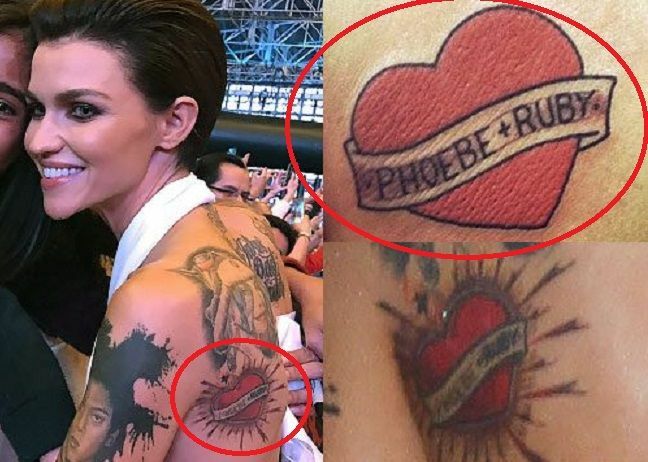 Meaning: Ruby Rose has a number of different tattoos on her body. She has inked the word smile on the left side of her rib cage. Such tattoos are very common among people. It means that whatever happens in life, one should never let anyone to dull your sparkle. 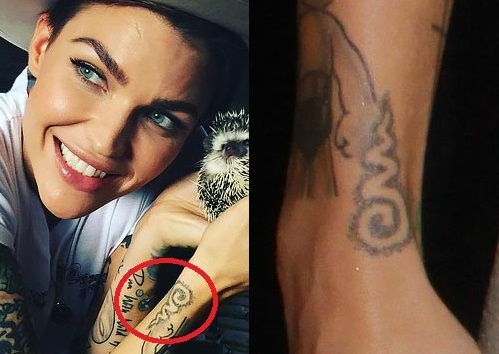 Meaning: Just near her Gumby tattoo, Ruby Rose has inked words ‘Run With Wild Horses’ on her left forearm. Basically the words ‘Run with wild Horses’ shows the independent character of the person. It means that the person is not answerable to anyone and is a free spirit who follows the heart. Tattoo: LIFE Tattoo on the right wrist. 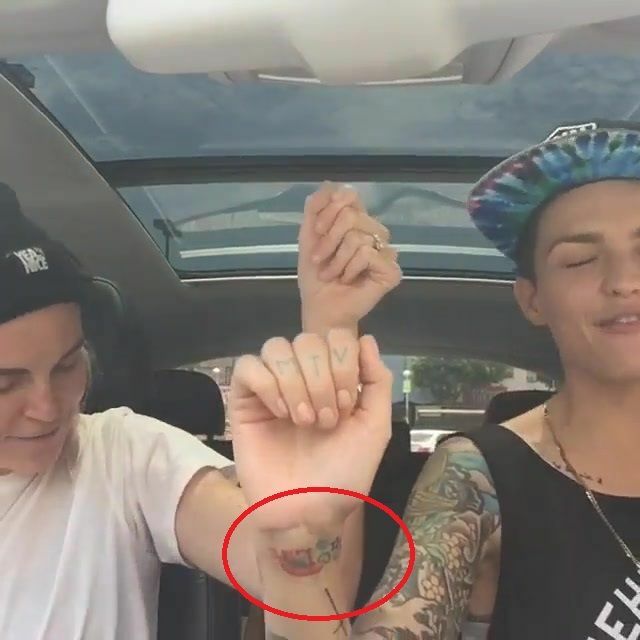 Meaning: Ruby Rose has inked the word ‘LIFE’ on her right wrist in orange and red color. She has inked four different symbols next to this tattoo with a rainbow over it specifically talking about the LGBT community. Tattoo: Symbols Tattoo on the right wrist. 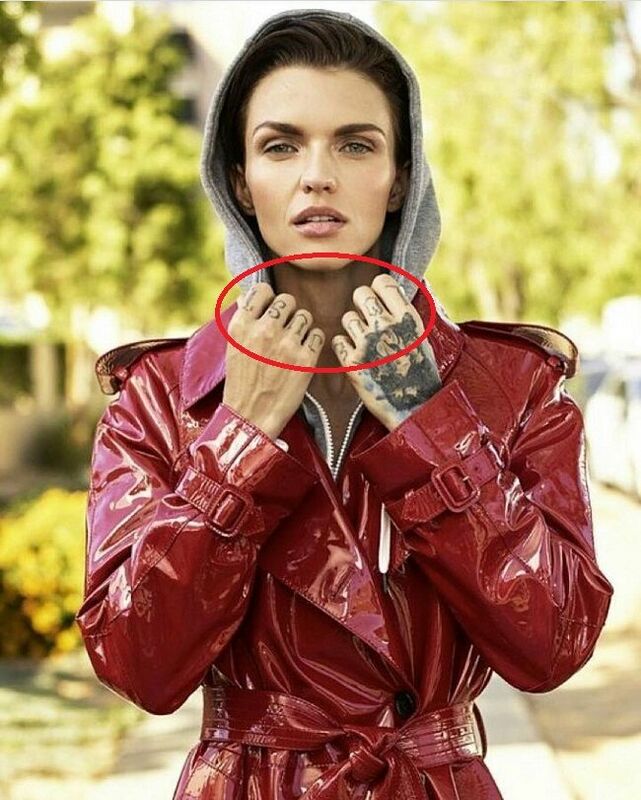 Meaning: Just next to her LIFE tattoo, Ruby Rose has inked four different symbols on her wrist. It includes a purple smiley face, a green heart, a black star, and a blue peace sign. She has inked these symbols to show her support and love towards the LGBT community. Tattoo: Rainbow Tattoo on the right wrist. Meaning: Just above her LIFE tattoo, Rose has inked Rainbow on her right wrist. Rainbows tattoos are very beautiful, colorful and joyful tattoos. 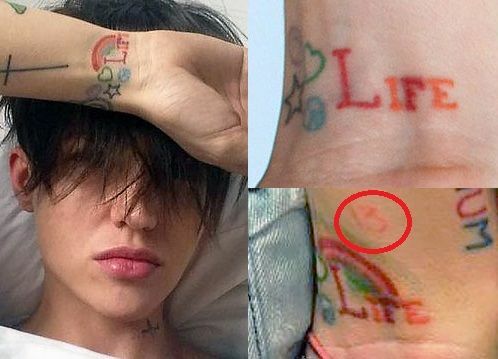 Ruby Rose is a lesbian, so to show her love and support towards the LGBT community, she has inked rainbow tattoo along with the word LIFE and four different colorful symbols. Tattoo: Number 13 Tattoo on her right wrist. 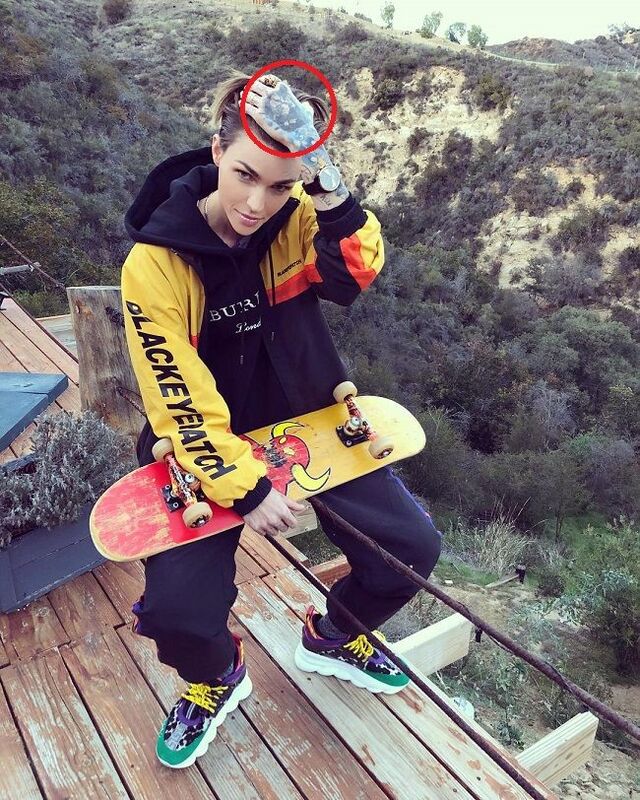 Meaning: Ruby Rose has inked number 13 tattoo on her right wrist, just above her rainbow tattoo. She got the tattoo number 13 as a part of a tradition in which different tattoo parlors give discounted tattoos of the number 13 on every Friday the 13th. Tattoo: Pet Dog Tattoo on the left hand. 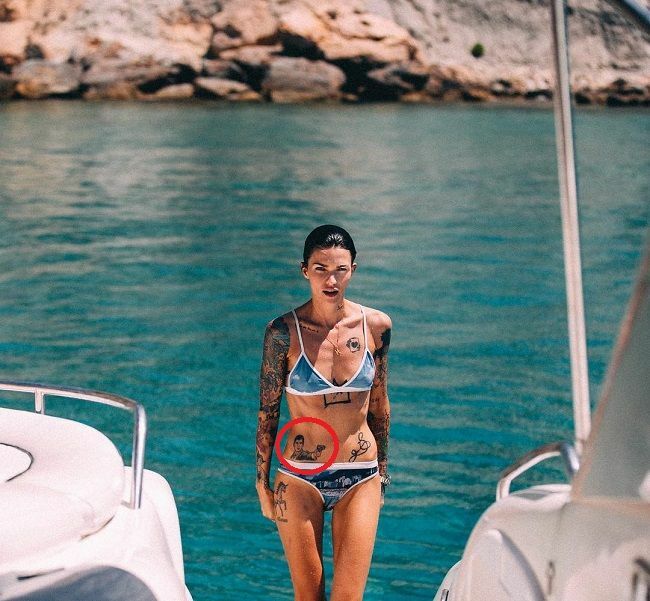 She modified this tattoo by adding blue bubbles around the face of her pet dog. Tattoo: Mask on left forearm. 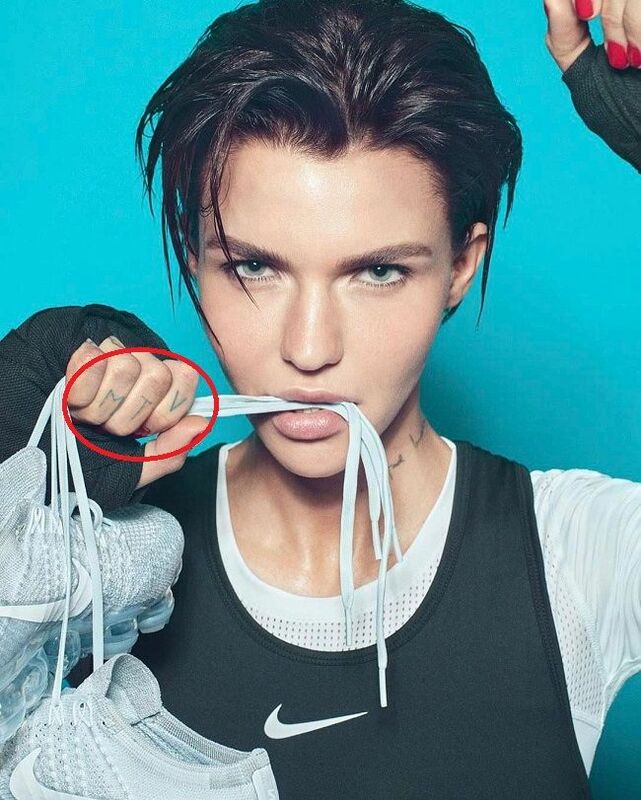 Meaning: Ruby Rose has inked a mask on her left forearm. Masks tattoos are basically used to show the different emotions of the person. These type of tattoos are very common and popular all over the world. Tattoo: Key Tattoo on the left forearm near her elbow. Meaning: A very beautiful designer key has been inked by Ruby Rose on her left forearm near her elbow. Keys tattoos have different spiritual meanings. Generally, it is considered that the person has all powers to make any impossible thing possible. New ways, hidden doors, new paths, doorways to unknown, mysterious are some of the different meanings of such kind of tattoos. Tattoo: Teenage Mutant Ninja Turtle Tattoo on the right forearm. Tattoo: ‘…And Breathe Me’ Tattoo on the left side of her neck. 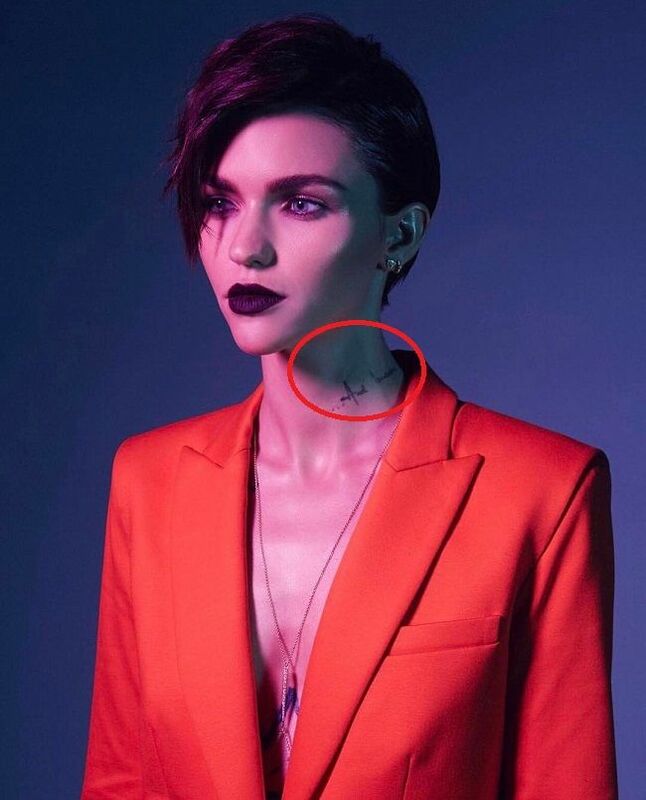 Meaning: Ruby Rose has inked ‘…And Breathe Me’ on the left side of her neck. Sia Furler, an Australian singer, is a very good friend of Rose. Inspired by Sia’s song ‘Breathe Me’, Ruby has inked the tattoo ‘…And Breathe Me’ on the left side of her neck. Tattoo: Rabbit Tattoo on right side of the lower back. 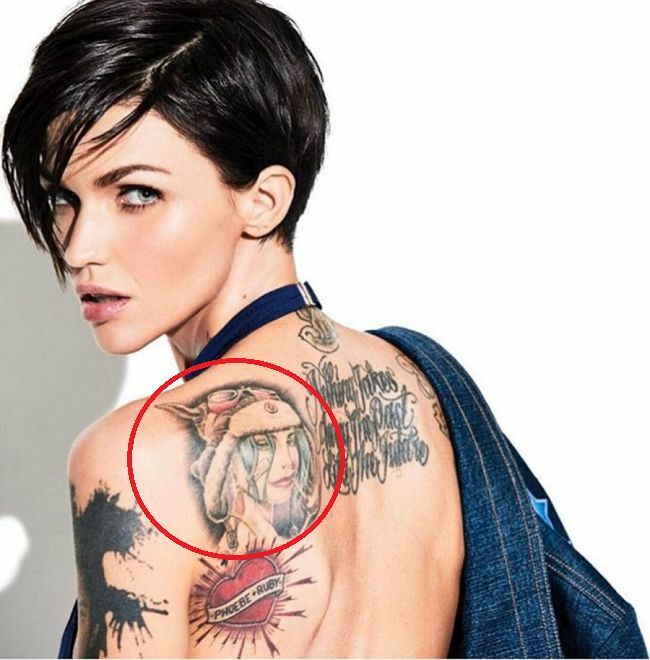 Meaning: Ruby Rose has a white rabbit tattooed on the right side of her lower back. 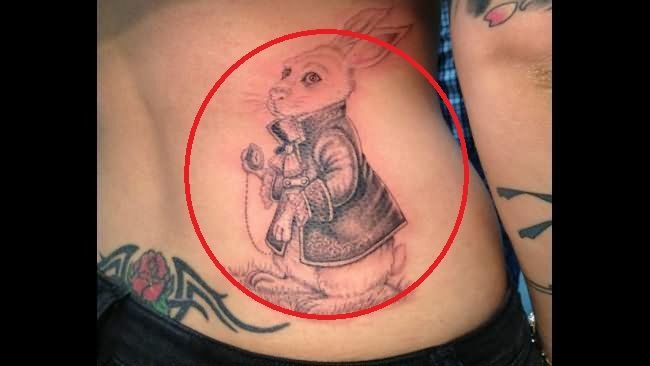 The rabbit is wearing a jacket and holding a pocket watch. This tattoo has been inspired by Lewis Carroll’s book ‘Alice’s Adventures in Wonderland’. She even tweeted, “And we done 3 hours I want to vomit on myself”. Tattoo: ‘here’ Tattoo on the middle finger of the left hand. Tattoo: A text saying ‘There is nothing new under the sun’ on her upper left arm. Meaning: Ruby has got a number of tattoos all over her body. She has a very unique form of a tattoo on upper left arm, which says, ‘There is nothing new under the sun’. According to Ruby, her body is a canvas. Tattoo: Polly Esther from Samurai Pizza Cats tattoo on the right forearm. Meaning: Ruby has been very fond of animated cartoon characters. In 2012, she has inked Polly Esther from the anime TV show Samurai Pizza Cats on her right forearm. In this series, Polly Esther has been portrayed as an independent, fiery-tempered and dynamic female. Probably these characteristics of Polly Esther matches with the personality of Ruby that is why she has inked this tattoo on her body. Tattoo: Cyclone Swirl Tattoo on side of her right wrist. Meaning: A cyclone swirl tattoo is a very common tattoo. People usually get this inked for fashion purpose. Maybe Rose has also inked it to describe her style. Tattoo: D.I.Y Tattoo on side of her left wrist. 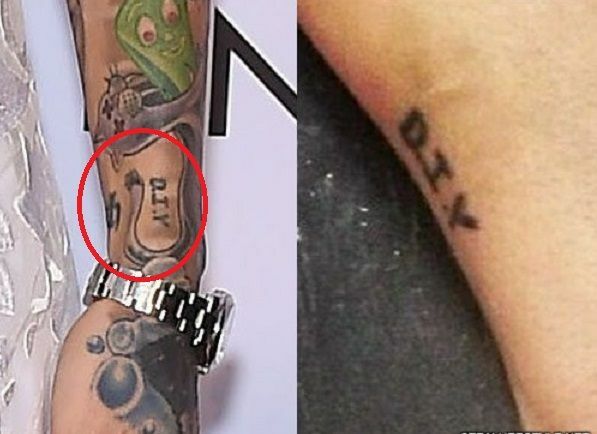 Meaning: The tattoo D.I.Y has been inked by her on side of her left wrist, just below her Gumby tattoo. It is an acronym of the word ‘Do It Yourself’. Tattoo: Jean-Michel Basquiat Tattoo on the upper left arm. Meaning: Jean-Michel Basquiat was an American Graffiti Artist. He was very famous because of his street art during the 1970s and 1980s but died because of the overdose of drugs. 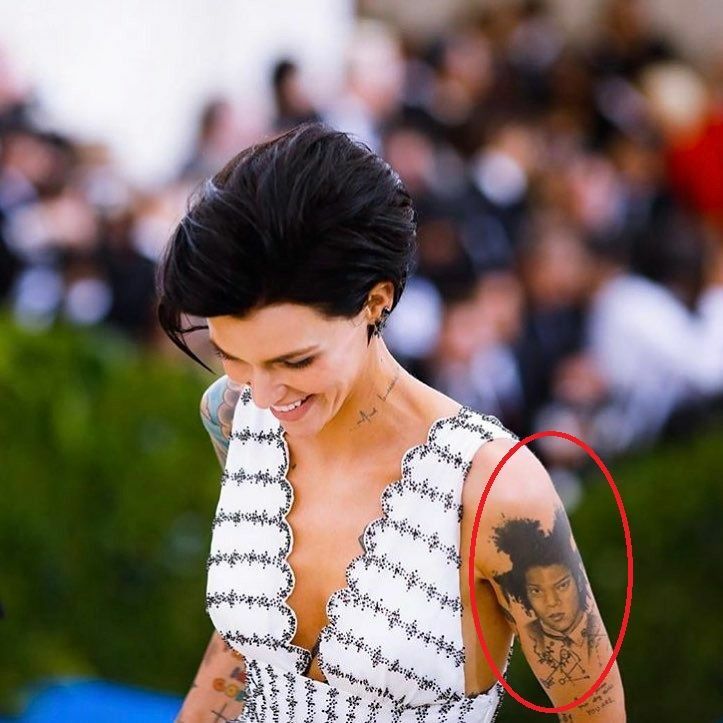 Ruby Rose has been a huge fan of Jean-Michel Basquiat. She has inked a huge portrait of Basquiat on her upper left arm to express her love and respect towards her idol. Tattoo: Be the person your dog thinks you are Tattoo on the left upper arm. Tattoo: MEOW Tattoo on her inner lower lip. Tattoo: Rosary Beads with a Cross Tattoo on the left side of her waist. Meaning: Rosary beads tattoos usually define the Catholic faith. Since rosary beads with a cross is a symbol of prayer, usually used to keep protection from all kinds of negativity and evil spirits. So in order to create a positive aura around her, Rose has inked this tattoo on the left side of her waist. Tattoo: Crown Tattoo just below her chest. 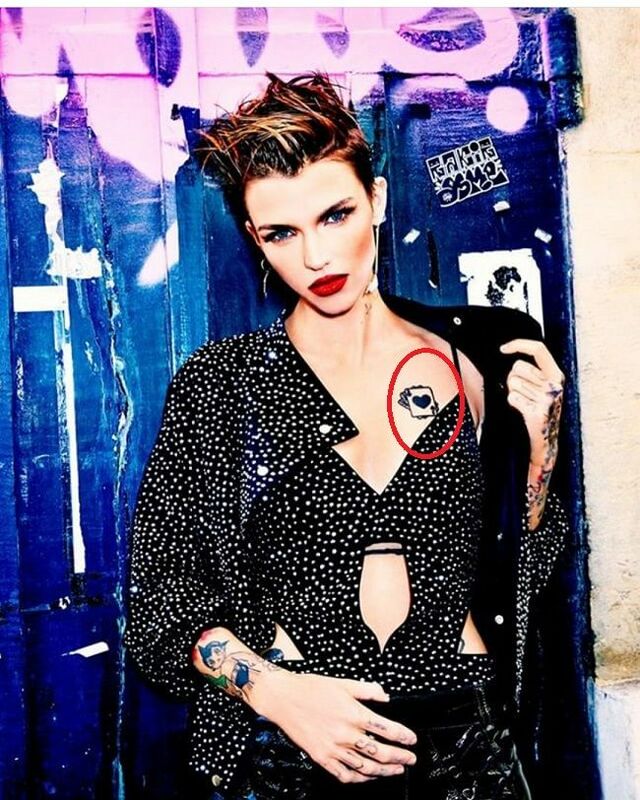 Meaning: Ruby Rose has inked a crown cartoon just below her chest, from the works of great street artist Jean-Michel Basquiat. Ruby considers Basquiat as her idol that’s why not only the design of the crown but she has also tattooed the portrait of Basquiat on her body. Tattoo: Maybe she’s born with it Tattoo on her right collarbone. Meaning: Ruby Rose is popularly known as the face of the famous cosmetics brand Maybelline New York. Maybelline has an advertising slogan called ‘Maybe she’s born with it. Maybelline it’s Maybelline’. 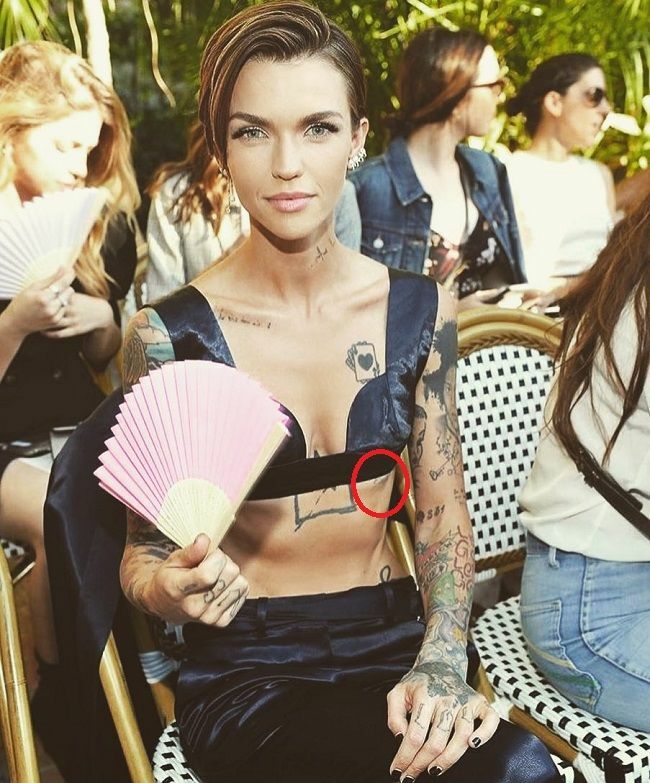 So being the top model for such brand in Australia from past more than 10 years, Ruby Rose has inked this tattoo on her right collarbone. Tattoo: Metallica Song lyrics Tattoo on the left side of her rib cage. Tattoo: A Unicorn With a Name Tattoo on her right thigh. In 2015 she decided to for laser tattoo removal treatment and took her first session out of total ten. Later, she didn’t continue the procedure and this tattoo is still visible on her body. Tattoo: Archer Tattoo on the right side of her stomach. Next day she went to a tattoo parlor and got it inked on her body. Tattoo: Tribal Design with a Rose tattoo on her lower back. Tattoo: Opossum Tattoo on right side of her rib cage. Meaning: Rose has inked an opossum climbing a tree branch on the right side of her rib cage. Opossum animals usually use their immunity for good. Tattoo: Heart with a Banner Tattoo on the left side of her back. Later she modified her tattoo by getting the name Phoebe removed with the help of laser tattoo removal treatment. Ruby altered her this tattoo later by adding paint strokes all around the heart. Tattoo: Tank Girl Tattoo on the left side of her back. Tattoo: A Writing Tattoo on the center of her back. 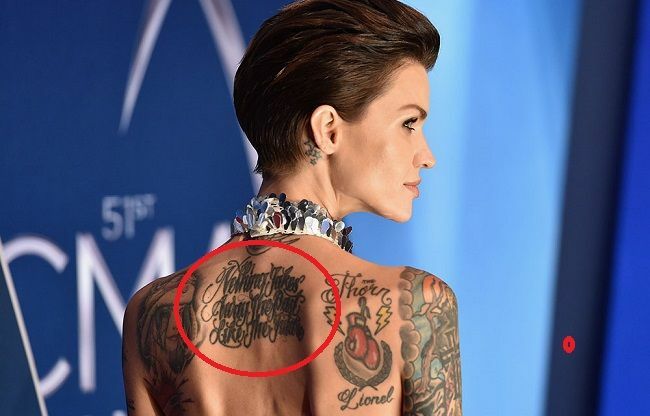 Meaning: Ruby Rose has inked a writing on her backside in large fonts saying, ‘Nothing takes Away The Past Like The Future’ in 2010. 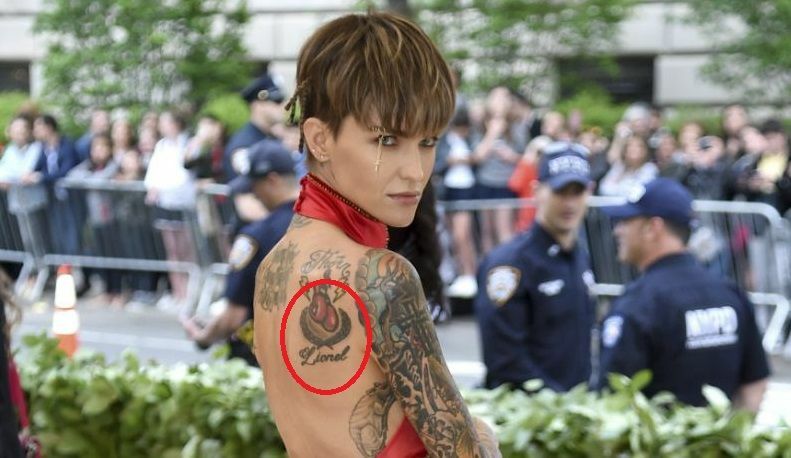 Tattoo: Ruby Rose has inked two boxing gloves with a name Lionel on right side of her back. 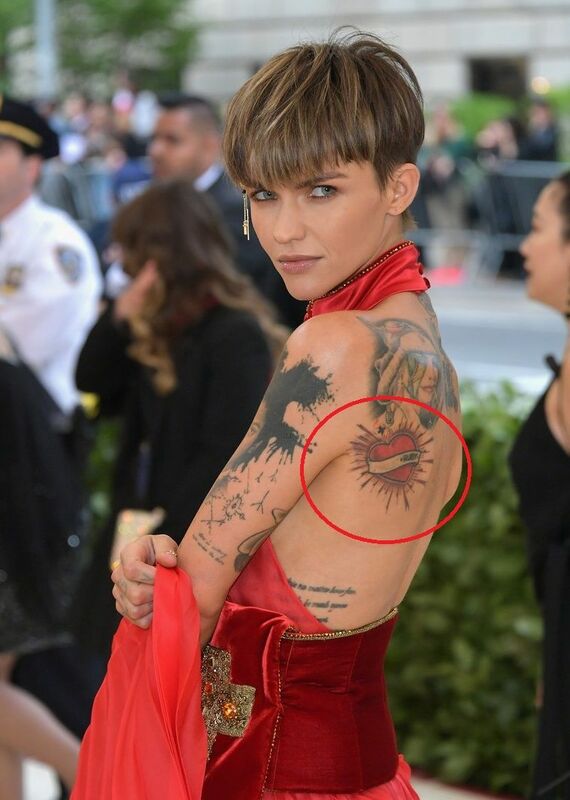 Tattoo: Ruby Rose has inked lighting bolts and the word thorn on right side of her back. Meaning: Ruby was very close to her godfather Lionel and as a tribute of love and respect towards him, Ruby had inked a pair of boxing gloves with two lightning bolts with name thorn and Lionel on it. The Thor is Ruby’s boxing nickname. Tattoo: A pattern of Cherry Blossom, Waves, and Tiger on the inner portion of the right arm. 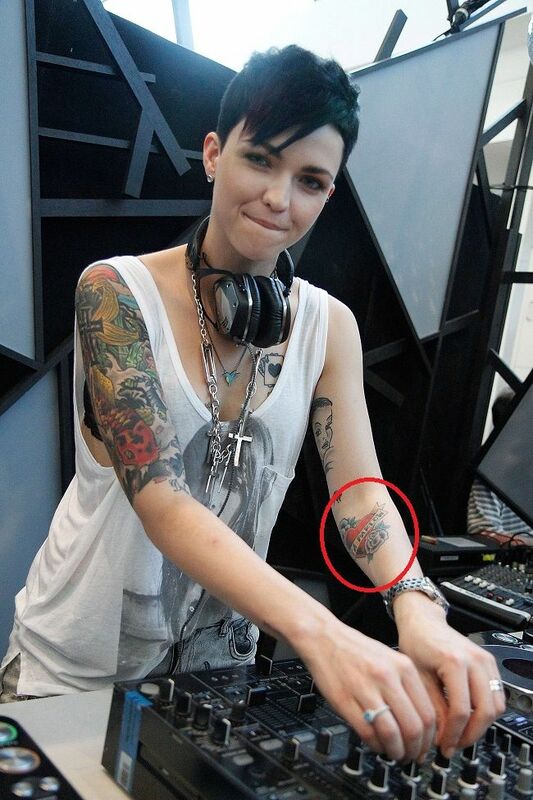 Meaning: Ruby Rose has inked a pattern of cherry blossom, waves, and tiger on the inner portion of her right arm. 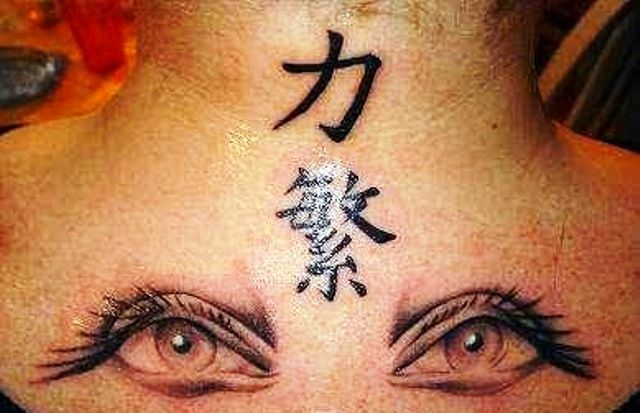 This tattoo specifies both the soft and hard nature of the person. Tattoo: Pattern of Cross, Fish, and Waves on upper right arm. Meaning: A pattern of cross, fish, and waves have been inked by Ruby Rose on upper right arm. It’s a very colorful tattoo having a large cross in the center. Ruby showed lots of interest in cartoon animated characters, in fact each and every tattoo on her body is very unique and colorful. Meaning: Ruby has inked a beautiful ladybug along with a number 834 near it. Being a lesbian, Ruby inked this tattoo to show her support and love towards LGBT community. Ladybug is a symbol of good luck. 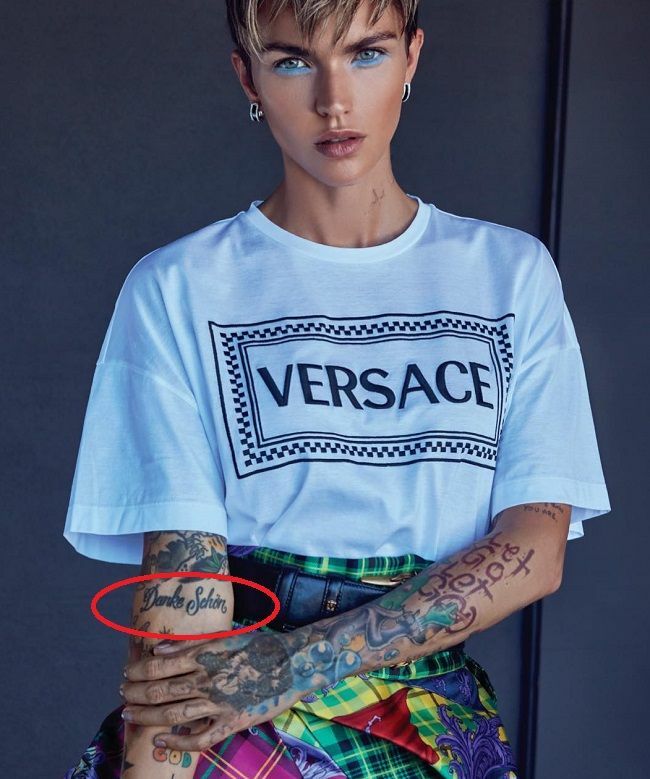 Meaning: Ruby has got a beautiful heart shaped tattoo with a banner stating Dita Parlow and two beautiful roses along with it on left forearm. Heart shaped tattoos are basically symbols of pure love and emotions. Tattoo: Giant Pan tone Color Tattoo on back.